From romance to ravioli, dumplings to degustations – February is shaping up to show us a whole lotta love. It’s the shortest month of the year so we’re being selective about what shenanigans we get up to, so here is our pick for month! Step out of Bowen Hills and into bustling Beijing as King Street transforms for Lunar New Year. On Friday 16th and Saturday 17th of February the dining precinct will be decorated in vibrant reds and golds, lucky lanterns and feature performances from traditional drummers and lion dancers. The only resolution you’ll need for Year of the Dog is to score a reservation! Roll in to Fat Dumpling to indulge in a four-course feast of stir fried greens, spring rolls, braised pork belly and handmade dumplings and a complimentary drink for $65pp or enjoy an aromatic three-course Vietnamese banquet at Banoi for $30pp. Love or hate it, part of a couple or aggressively single – Valentine’s Day is almost upon us. We believe that no matter your marital status you deserve to have a good night, whether that’s screaming karaoke, candle lit dinners or anti-Valentine’s Day parties, we’ve got the scoop on what’s good this V-Day. Loved up? Check out our date article here. Rather watch the whole world burn than send a rose? We got you. Don’t let the Monday blues creep in too early – seize Sunday and celebrate! For $50 (add $40 for matched wines), enjoy a tasting plate from Fish Lane’s favourite wine bar, La Lune. The menu changes weekly but previous tastings have included kangaroo tartare, pork collar and cheeses. Sunday is sorted. Whether you salivate over sorbet or can’t get enough of gelato – we don’t discriminate against ice cream preferences. The only problem we have with Gelato Messina is how long it takes us to decide on a flavour. Thankfully the team have come up with a delicious solution to our indecisiveness, the Gelato Degustation is back! They’re keeping hush on the deets but if previous events are anything to go by this will sell out QUICKLY – so book in now! Sick of all your mates moving to Melbourne? Feel like you’re missing out? No more friends, no more. Brisbane is getting a little slice of the south with the 100 Burger Group bringing their wheeley awesome concept to Bowen Hills. Welcome to Bowen Hills will be located in the Brisbane Showgrounds from mid-February 2018, bringing dozens of food trucks and a gin bar. Here at the G&G we believe that any meal with less than two courses is really just a snack, and Bacchus have a degustation guaranteed to have you agreeing with us. The ultimate celebration of local seafood, the Queensland Coast Degustation features freshly shucked rock oysters, lightly charred Hervey Bay scallops, cuttlefish with grape, lime and chive, Moreton Bay bug and gold band snapper ravioli before finishing with mango and petit fours – euphoric AF. 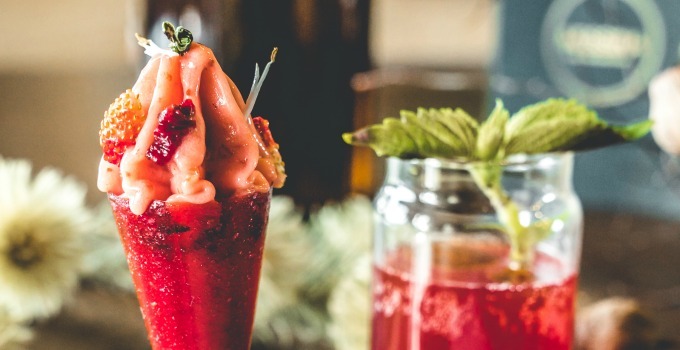 Once famous for pumping out some seriously sweet treats, Brisbane’s epic new rooftop function space is now home to some seriously sweet parties. With a birds-eye view of the skyline and artwork from internationally renowned artists – it’s the perfect space for your next soiree. It’s only available until April, so get in quick before it melts away! Spice up your summer at Spicers Tamarind Retreat with the first ever Sunshine Coast Asian Food Festival. Enjoy cooking demonstrations, live entertainment and six courses of mouth-watering Asian dishes. Wrangle your mate, dust off your picnic blanket, relax in the sunshine for a blissed-out Sunday. Get tickets here. Find a mate, pick a date, and get some food on your plate – there’s not much time! - the gourmand whose goal for 2018 is to eat an entire wheel of cheese.